1. Heat a griddle or barbecue to hot. Brush the courgettes with oil, sprinkle over the zaatar and cook in batches for 2 minutes on each side until tender and seared. Remove from the heat and set aside. Tip the peas into a pan of boiling water, cook for 3 minutes then drain and set aside. 2. Cook the pouches of grains according to the pack instructions, then tip into a large bowl and break up with a fork. In a small bowl, make the dressing by whisking together the lemon zest and juice, harissa and olive oil. Add to the grains and toss to coat evenly. 3. 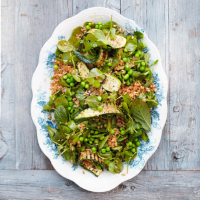 Gently combine the cooked courgettes, peas, mint leaves and pea shoots with the dressed grains. Serve immediately. Lovely with grilled halloumi and a spoonful of natural yogurt to cool.